Fukuyama E., S. Aoi, C. Hashimoto, and M. Matsu' ura, Joint simulation of earthquake dynamic rupture and seismic wave propagation, Proceedings of First International Symposium on Integrated Predictive Simulation System for Earthquake and Tsunami Disaster, 245-254, CREST/JST, 2006. Hashimoto, C., E. Fukuyama, and M. Matsu' ura, Joint simulation of quasi-static stress accumulation and earthquake dynamic rupture, Proceedings of First International Symposium on Integrated Predictive Simulation System for Earthquake and Tsunami Disaster, 239-244, CREST/JST, 2006. Hori, T., Mechanisms of separation of rupture area and variation in time interval and size of great earthquakes along the Nankai Trough, southwest Japan, J. Earth Simulator, 5, 8-19, 2006. Kato, N., Expansion of aftershock areas caused by propagating postseismic sliding, Geophys. J. Int., 168, 797-808, 2007. 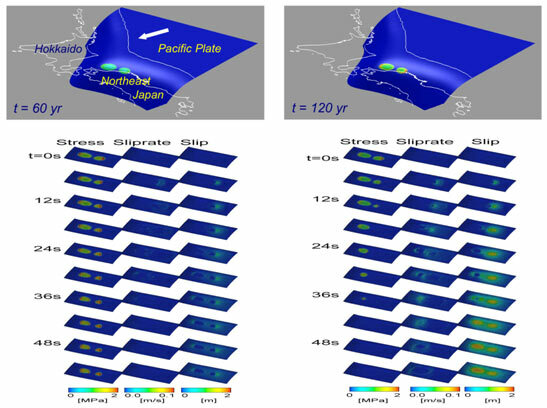 Kato, N., X. Lei, and X. Wen, A synthetic seismicity model for the Xianshuihe fault, southwestern China: simulation using a rate- and state-dependent friction law, Geophys. J. Int., in press , 2007. Shibazaki, B., K. Garatani, and H. Okuda, Finite element analysis of crustal deformation in the Ou Backbone Range, northeastern Japan, with non-linear visco-elasticity and plasticity: effects of non-uniform thermal structure, Earth, Planets and Space, in press, 2007. Suzuki,T. and T.Yamashita, Non-linear thermo-poroelastic effects on dynamic earthquake ruptures, J. Geophys. Res., 111, B3, DOI10.1029/2005JB003810, 2006. 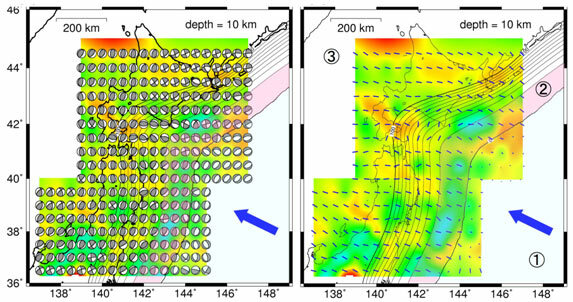 Terakawa, T., C. Hashimoto, and M. Matsu' ra, 3-D seismogenic stress field in the northeastern part of Japan, inferred from CMT data inversion, Proceedings of First International Symposium on Integrated Predictive Simulation System for Earthquake and Tsunami Disaster, 215-226, CREST/JST, 2006.